The members section has been updated for the 2005 members. Pictures will be put up soon. Thanks to all who have made the camps a success. The audition process will complete after the first several days of band camp, so keep practicing. During band camp, we will be using a metronome through a speaker, so also practice with a met - you'll be that much more ahead. Finally, we'll be working on flam accents, taps, drags, inverts, cheeses, fives, _______ (insert hybrid). The cadence is full of them and I'm sure the show(s) will be too. If you need work in this area (meaning if you can't play any/all of those well), start working on them - they WILL play a large roll in your audition. Finally, you can find the tentative schedule for band camp and the rest of the season (games, etc.) here. Also, if you haven't done it yet, cross registration information is here. All of the exercises should be available in PDF Format. In additon to flam-accent based rudiments, be looking at the Double Beat exercise (the SCV one), Spanks, and Krackus. We'll be hitting these early in band camp and they will also play a significant role in the audition process. The style for auditions will be a little different than it traditionally has been in the past. Instead of having individual auditions (which we feel doesn't accomplish very much), we're going begin playing as a line. This will put more of a focus on a person's ability to listen and blend (which really is more important than your ability to ram notes). The process will begin at the first camp. Everyone may start on the instrument of his/her choice but might be moved around some during the audition process. We believe that this will be the most fair for everyone and will give the best placement in the end. Auditions will conclude at the beginning of band camp with the setting of the line. Please note that your attendence at the camps, while not mandatory, will greatly improve your chances of marching what you want. While the focus for the camps are the simple warm-up style exercises (8s, bucs, rolls, etc), there is a strong likelihood that by and camp, we'll be playing through a few of the chopier exercises (SCV double beat, cadence, etc). Since these will be more representative of the show(s) and the "in the lot" stuff, it'll be as important to be able to play them by band camp as it will the warmups. Again, a little preparation goes a long way... I'll post between then and now which ones to focus on. While it's not necessary, it would be very beneficial to auditionees (BOTH old and new) to at least try to look over / (dare I say) memorize the music before you show up (at least snares and tenors). It prevents a whole lot of things from happening and will make you much more confident in your audition. Finally, no preference will be give to "vets". It's our philosphy that the best hands/attitude combo takes precedent. New Exercises have been posted and old ones have been corrected. 6 bass parts are now available. The hand written exercises will put into finale soon. Keep checking back for READABLE versions of those exercises. And again, sorry for the delay. Also, SCV double beat and spanks have been posted. If you're bored and want something fun to drum, go for it. We won't hit these until later or at all. For the camps, focus on the warm-up exercises. These will be the emphasis. 8s, bucs, double beat, rolls, etc. We'll work on the fundamentals during the camps and get to the more difficult stuff after the line is set (during band camp). So again, don't practice SCV double beat or the Cadence or anything else along those lines. It is unlikely that we'll have time to get to them during the camps. New 2005 Stuff is finally up and rolling... A few new exercises have been added. The quality is poor but readable - It'll be fixed as soon as exams are over. Also, the summer camp schedule has been finalized. If you are a returning member and you haven't already done so, e-mail Ashley to let her know you're coming back. 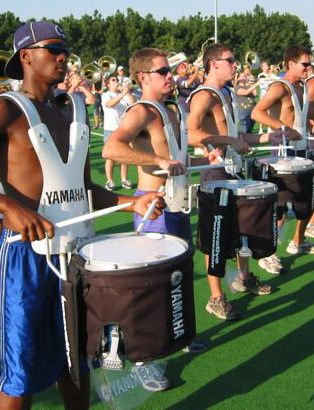 If you are a new member for the 2005 season, let us know if you'll be at either one (or both) of the camps and what your instrument preference is. Official Tech Drumline 2005 Flyer. Distribute to drummers and groupies alike. New exercises posted on downloads page.